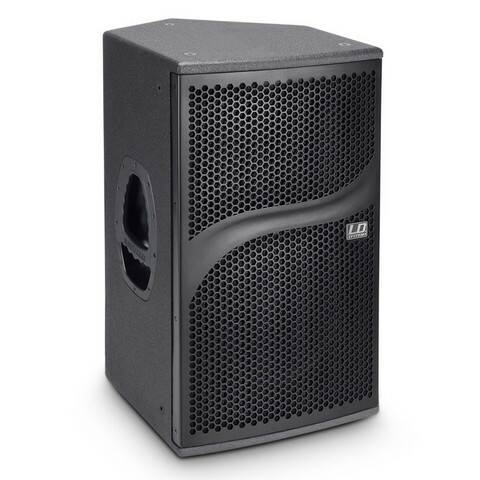 The LD Systems DDQ 15 is an ultra high efficiency 2-way biamped loudspeaker for FOH and monitor applications, delay lines, portable PA systems and fixed installations delivering superior touring class performance. A 24-bit/48 kHz custom Sharc DSP provides volume control, delay, EQ, crossover, phase alignment and comprehensive protection functions for precision adjustment and reliable operation while its 1ms look-ahead limiter ensures distortion-free audio at all levels. In addition, the DDQ features digital encoding, a high pass filter and ground lift switch. The 15” FaitalPRO neodymium woofer and BMS compression driver complement is biamped by two Hypex UcD700 Class D modules with high efficiency SMPS and extremely low noise and THD. With 1.400 watts RMS output, 38 Hz – 20 kHz frequency response, 80° x 50° dispersion and a peak SPL of 136 dB the DDQ 15 provides superior high-power audio performance. The 15 mm birch ply bass reflex enclosure with an extremely durable polyurethane finish incorporates a 50° angle and asymmetrical HF horn rotatable for floor monitor use. The hardware includes a steel grille, multiple flying points and the innovative Evolutive handles for easy portability. Low/mid driver voice coil 3 "
Tweeter voice coil 1.75 "